gbTouch 3, Other Music Software from Harmony Systems. Harmony Systems announced the availability of gbTouch 3.1 and gbRemote 1.1 upgrades to their iPad and iPhone music controller applications. 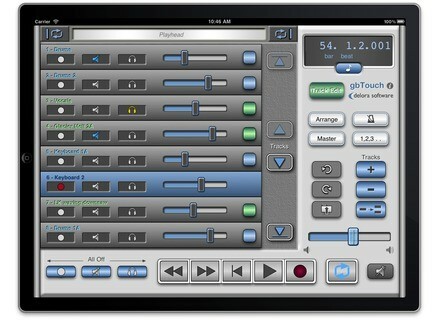 gbTouch, for the iPad, and gbRemote, for the iPhone/iPod touch, offer control surface and remote control capability for the Apple GarageBand music application on the Mac. The Delora gbTouch app gives users the ability to select a theme style for the "look" of their app, =by selecting a gbTouch preference in the iOS Settings application. gbTouch 3.1 adds a fourth style that incorporates user requests for vertical faders. The new "Mixer" theme style offers GarageBand users the feel of a mixing board on their iPad. New style rotaries on the Track Edit screens complement this theme. gbRemote 1.1 now comes standard with its own two theme styles, including a black "Minimal" theme to supplement the current gray "Texture" style. gbTouch 3.1 and gbRemote 1.1 require the installation of gbLink 3.1.0, a small OSX application, on a Mac. gbLink is free and available for download at the Delora website, www.delora.com. gbTouch 3.1 is available for $9.99 USD on the App Store, with gbRemote at $2.99. Both are free upgrades for existing customers. Yonac Software Shredder Yonac Software announces the release of Shredder, now available on the iTunes App Store. ESI Phonorama The ESI Phonorama is a solution for transfering your old tapes and records to mp3 or wav files.